Bathroom Vanities and Accessories Design and Tips | DecorPlanet.com Blog: Themed bathrooms - gimmicky nostalgia or nerdy excellence? Themed bathrooms - gimmicky nostalgia or nerdy excellence? While some people might consider a themed bathroom tacky, others may actually prefer to add a little kitsch and gimmickry to their bathroom decor. Examples of this are all over the web. In fact, there's an entire Tumblr dedicated to the subject. The unnamed person who maintains the site describes themed bathrooms as possibly the "most underrated and heartwarming remnant of the '70s," and that they "represent the absolute peak of American interior design." There's a good chance that not everyone shares that opinion, but most people could agree that the photos of rubber duck-, cowboy-, and beach-themed bathrooms he or she provides are lots of fun. One particularly elaborate bathroom setup on this site features bathroom accessories that all relate to decks of playing cards. For example, the shower curtain displays a king and a queen, while the bathmat on the floor shows a "royal flush" hand of cards alongside several poker tips. Frankly, the themed bathrooms on the aforementioned Tumblr look downright conventional compared to some of the bathrooms NBC News pointed out in their list of the 10 nerdiest bathrooms in the world. The difference is some of the nerdy bathrooms are located in businesses, not individual homes. For example, a bar called the Way Station in Brooklyn, New York, has installed a bathroom based off the time traveling police box - a.k.a. 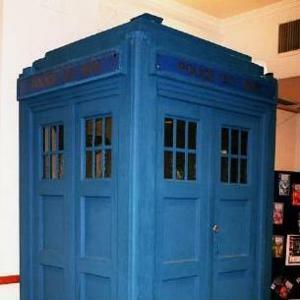 the "TARDIS" - used by the Doctor and other characters on the British science fiction series "Doctor Who." The news source explains that, in this instance, "TARDIS" is an acronym for "Time and Relative Drinking in Space" instead of "Time and Relative Dimension ..." NBC News does not clarify whether, like the Doctor's space and time hopping vessel, the Way Station's bathroom defies physics by being bigger on the inside. On a similar note, a Spider-Man bathroom put together by Riley Replicas is highlighted by NBC. It's made to look as though the villains Dr. Octopus, the Sandman and the Green Goblin are crashing through a faux-brick wall, presumably to attack the hapless bathroom user. But not all the themed bathrooms on the NBC article are that elaborate, or presumably expensive to set up. For one especially creative example, one bathroom stall has the the first chapter of a Harry Potter book transcribed onto one of its walls. Later, a Star Wars-themed shower stall - featuring the likenesses of C3PO, R2D2 and Chewbacca - looks like all it required was a set of multicolored tiles. What are the best colors to paint a bathroom?